Thallus: foliose, closely appressed to agglutinated up to the lobe tips, 1-3 cm in diam., dichotomously pinnately or subpinnately lobate lobes: radiating, confluent, flat or strongly convex, but sometimes concave near apex, 0.5 upper surface: gray, bluish gray or yellowish gray, punctiform, sometimes white patchy pruinose, sorediate soredia: farinose, in initially marginal, fissural, later laminal, globose, soralia pseudocyphellae: present, marginal, rarely also laminal, usually restricted to the peripheral parts of the lobes, rarely reticulately confluent medulla: white, the lowest part seldom orange, if so, only at the lobe tips lower surface: black in center, paler towards lobe tips, erhizinate Apothecia: very rarely present (not seen in Sonoran material), laminal on thallus, 0.7-1 mm wide disc: black, not pruinose ascospores: brown, 1-septate, ellipsoid, 12-14 x 6-7.5 µm Pycnidia: rare, immersed in warts conidia: bacilliform 4-5 x 1-1.7 µm Spot tests: upper cortex K+ yellow, C-, KC-, P+ yellow; medulla upper and lower part K-, C-, KC-, P- Secondary metabolites: upper cortex with atranorin; medulla with divaricatic acid and few terpenes in low concentration. Substrate and ecology: on rocks, rarely on bark from sea level to 1000 m World distribution: north- and southeastern U.S.A. and Sonora Sonoran distribution: especially in thorn and deciduous forests of Baja California Sur, Chihuahua and Sonora. 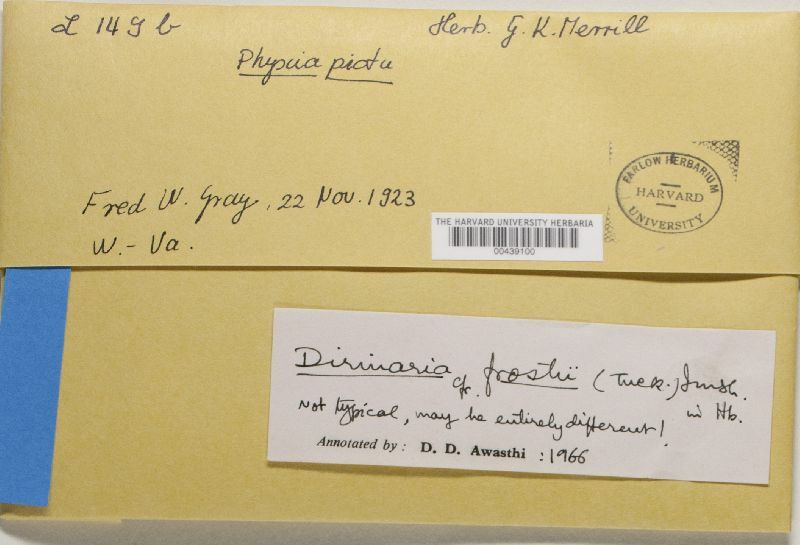 Notes: Once recognized, Dirinaria frostii is most easily identified by the origin of the soralia. Unlike in any other sorediate Dirinaria species they are arising from marginal (or apical to subapical) fissures, becoming orbicular and sublaminal later. Young specimens of D. frostii resemble very much Pyxine subcinerea and have sometimes been identified as that species. As no collections are known from central or western states of North America, the Sonoran findings are somewhat astonishing. But we have compared these specimens with collections from Arkansas and Missouri and they are identical with the Sonoran specimens in every respect.